Mount Ephraim NJ Real Estate Info will help you learn everything you need to know about Homes for Sale in this Camden Co Community. Many people will go the "shorter" name and call it Mt Ephraim. 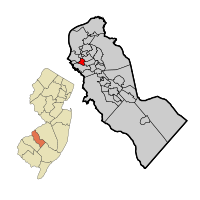 Several major roads go through this tiny community of less than 1 square mile - I-295, Kings Highway, I-76 for access to Philadelphia and the White Horse Pike (Rt 30).